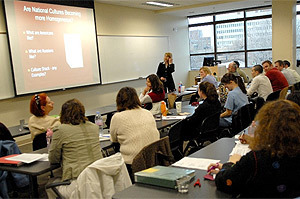 Augsburg’s MBA program is organized around small groups, or cohorts. Students in a cohort program model stay together through the sequence of classes for the duration of the program. This provides a continuous, interactive, and collaborative learning environment. The cohort model fosters a cohesive learning community where students not only learn from one another, but also mentor and coach each other. You’ll share diverse professional expertise and experience as you work in teams on projects, case studies, presentations, and simulations, both inside and outside of class. Professionals bring a wealth of work and personal life experiences with them into the classroom. The personal connections and relationships you build with fellow students and faculty will extend into an important and valuable network as you take your career to new levels.